What is the equation that equals hope? I have never really understood hope. As a kid, I didn’t want to look forward to something with an expectation. Too easy to get burned. I didn’t hold any ideas about the presents under the tree–I turned my wishing off and let myself be surprised or disappointed when the time came. Recently I heard a friend say she relies on hope to help her with a present moment that feels overwhelming; maybe hope is about providing a perspective on “now” that is not based in despair. Maybe hope is not simply wishing for a future that is not like this present. If I can infuse the present with a flavor of optimism then I can endure it or I can thrive even. Hmmm…sounds fishy. Am I just putting on the rose colored glasses, or, in this case, the Rainbow Eucalyptus glasses? If I succumb to cynicism then hope dies right away. Cynicism is the dark that squelches light. Avoid it. If false hope is fantasy, cynicism is irrational bleakness. Then there is faith. If I move beyond simply daydreaming of things I want and get confident about those things I have hoped for, then I am, apparently, demonstrating faith. Faith is fortified hope, but it is still based on a wish for something to be something other than what it is in this moment. I believe in what I hope for and this makes me feel even better, safer, more powerful, possibly deluded if I put my faith/hope in the wrong basket. Choose wisely kiddos. Here is my definition for hope: I can choose to believe that I can bring all available resources to this moment, and that that is better and righter and more valuable than not doing that. I am unwilling to forsake this moment as not good enough. I am looking for the best this moment has to offer. If I lose hope to the future, I am missing now and that seems a waste. All the hope you will ever have is happening right…NOW. So all that is left is to find a way to make this rambling about the amazing Rainbow Eucalyptus in the photo. These beings are the psychedelic mardi gras of trees. I walked in to the grove of them (was led into the grove of them as a gift from Rose, which was really so great) and I felt joy and wonder and I didn’t need hope at all because I had everything I wanted. 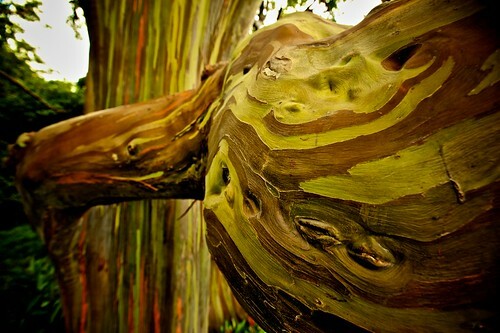 This entry was posted in Bend Light and tagged Bend Light, Color, Faith, Hope, Maui, Present, Rainbow Eucalyptus, trees. Bookmark the permalink. it is very practical. i might have to take out the word “all,” to really incorporate it into my way of doing things. but i so like the idea of making good with what is. Anita, I would agree with that. All often turns to nothing under the pressure. Thanks for this . . . indeed inspired my own musings as you will see in my latest post.